Patients are busy and can easily forget about something unless they are reminded about it more than once. Everyone has a certain attention span. It’s one of reasons that TV commercials are set to air on a specific schedule within the prime viewing time of their target market. The only way to get a patient’s attention and keep it is to use specific phrases, demonstrate value in advance and repetition of your message, so it finally gets through. I’ve created an approach called the ‘Referral Rebounder Pathway’, a seven-point technique designed to build a relationship with existing patients. The objective is to keep the practitioner and their clinic in the forefront of the patient’s mind. The message is repeated, and the outcome is that anytime the patient or someone in their social group need services, they think of you. Research has demonstrated that it requires several “touches” to convince patients to schedule an appointment, make a referral or take virtually any action. Seven was found to be the optimal number of contacts needed with a patient to obtain the desired results. The fact is – Patients get busy and don’t always check their messages or emails in a timely manner, necessitating multiple contacts. It is not enough to just tell patients what you have to offer. They need to see it and experience it and feel it. This is known as value in advance and is accomplished by giving them something that immediately shows them the value and benefits the clinic offers. Instead of giving patients your business card or brochure, do something for them. Human psychology follows a fairly predictable pattern. Individuals feel obligated to “return the favor” when something nice is done for them. For example, even before a patient makes an appointment, tell them something like the following. “Just for calling us, we’d like to send you a small token of our appreciation.” Make sure it speaks to the practitioner’s expertise and demonstrates the value to the patient. If you share an ebook, or an educational booklet, or a printed newsletter, make sure it speaks to the clinician’s expertise and demonstrates the value of treatment to the patient. The same principle holds true when working with physicians for referrals. Offer to treat a physician’s patient as quickly as possible. When they go back to the doctor, they’ll tell him/her how well the treatment worked and how quickly they were seen. The Referral Rebounder Pathway requires consistency and patience, even if there is no sign of an ‘immediate return’. Perseverance pays off and with the right intention, service and communication, clinicians can win over patients and physicians as referral sources. Being able to communicate through multiple methods is the best way to build an ongoing relationship with patients to generate referrals. Some individuals prefer a phone call or email, while others prefer a text message. Failure to communicate with patients after they’re discharged or have left the office is the number one mistake clinicians make. Practitioners often don’t follow up with even a single call in the mistaken believe that their services are so valuable or so awe-inspiring that there’s no doubt that their patients will be talking about them for weeks. With the growing amount of competition, that kind of thinking is a luxury clinicians simply can’t afford. In addition, the attention span of the human species is significantly lower than at any previous time. A study conducted by Microsoft Corp. and reported in Time® Magazine showed that an adult’s average attention span is eight seconds – shorter than that of a goldfish at nine seconds. Combined with increased competition, clinicians in private practice can no longer depend solely on their core services. You must create a foundation for referrals with value and repetition. When reaching out to patients, the process may resemble the following. Hmm – my sister hurt her arm last week. I told my sister about you and I need an appointment, too. I’m having trouble with my shoulder. Angela K. Troyer, Ph.D. and the program director of Neuropsychology and Cognitive Health at Baycrest, noted in Psychology Today that spaced repetition is the best technique to facilitate recall. Repeating something over and over without pausing is only slightly better than not repeating the information at all. It’s the primary reason that spaced repetition is so effective when contacting patients. Once a patient’s pain has been alleviated or their condition disappears, they tend to forget about it (and us) and move on. It’s up to the practitioner to provide a professional, consistent reminder of how much better they feel after treatment through simple and courteous follow-up communication. This is not just good customer service, it is sound business strategy. To win through repetition, the outreach from the clinic must be done in a timely manner and clinics must have a method that enables contact with patients via text, voice mail, email and phone. The last thing a clinician wants is to be perceived as insincere. For the most beneficial results, clinicians must use hypertargeting and segmenting of their patient list. Trigger phrases are designed to demonstrate empathy. Carolyn Thomas at MyHeartSisters.org, noted that in a Boston University study published in the journal Medical Teachers, empathy for other people begins to decline as students go further through medical school, even those who are naturally empathetic. Clinicians must nurture and demonstrate more empathy to patients. It’s inevitable that there will be patients and physicians who request that the clinic not contact them anymore. That doesn’t mean practitioners should become discouraged and stop all their efforts – quite the contrary. This is the intended outcome of the referral rebounder pathway. Referral Rebounder Pathway interactions with patients are critical. Every clinic should have a staff member that dedicates at least a half hour each day to contacting patients. Another option is software that can be programmed with the clinic’s message and can be set to contact the appropriate patients at regular intervals. Software services like In Touch EMR automatically trigger reminders and integrate with over 500 applications including Therapy Newsletter to automate patient follow-up. There are several technological options for small private practices that may not have the available staff to perform those duties. One of those is Therapy Newsletter that offers done-for-you email and printed newsletters, autoresponders for discharged patients and website integration. It also provides downloadable books for patients, “refer a friend” technology for patients, unlimited faxing to physicians, and email capture for those who visit the clinic’s site. 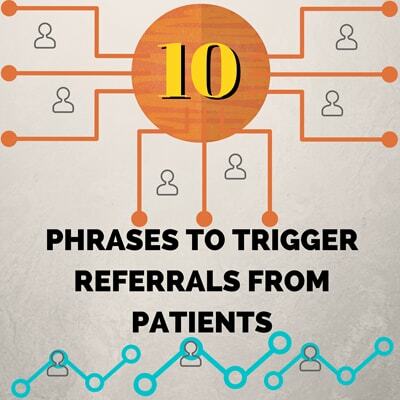 It requires an average of seven individual contacts with patients to stimulate a referral response. Maintaining contact is essential for building a foundation of trust with patients that will lead to willing referrals and the technology is available to foster the process that’s quick, easy and affordable. Maintaining contact is essential for building a foundation of trust with patients that will lead to willing referrals. Technology is available to make this a quick, easy and affordable process. to begin a 30-day trial for just $1, visit www.therapynewsletter.com. At In Touch EMR, we charge a flat fee per licensed clinician (no hidden fees or surprises) and it includes everything, unlimited claims and notes and infinite custom template creation. We are also a CMS recognized PQRS registry, we automate the reporting of PQRS and Functional Limitation G codes and provide automatic alerts for plan of care expirations, authorizations, progress note reminders and KX modifier alerts. Start your FREE 30 day trial now (no credit card required) and see why practices across the country are switching to In Touch EMR.